I have just been informed that today is National Cheesecake Day! So before you are tempted to head over to The Cheesecake Factory to indulge…please keep reading! One slice of Cheesecake from The Cheesecake Factory contains 450 Calories, 28 g of Fat, 43 g of Carbs and 7 grams of Protein. I am not necessarily worried about the fat, but that many Carbs for dessert bothers me! Also, did you know that according to THIS site, the crust at The Cheesecake Factory contains Margarine…WHAT!? and WHY?! Why not just indulge every now and then?? Some people believe that as long as you only eat treats like this occasionally, they won’t hurt you. This is NOT my philosophy! I have learned that if I allow myself to eat JUST ONE slice or JUST ONE roll, I want MORE!!! The food (carbs, sugar, wheat, etc.) completely TAKES OVER!! 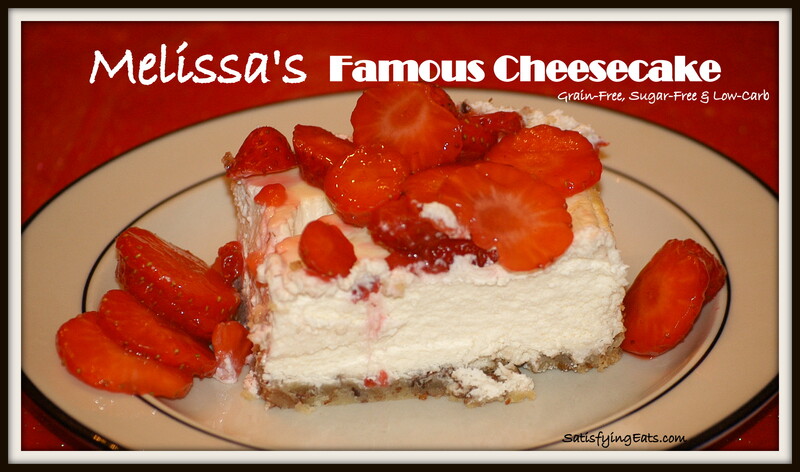 This is why I have chosen to devote my time to recreating my favorite recipes, and one of them is Cheesecake! In my short life (I’ll be 32 in a few weeks), I have made hundreds of cheesecakes! Yes, HUNDREDS, if not a thousand! I started making them when I was in high school. Back then I used low-fat graham crackers, margarine, fat-free cream cheese and fat-free sour cream. (Thank GOD I have been delivered from the fat-phobia!) In college, I actually sold cheesecakes to raise money for the Stroke Association. Then about ten years ago, after I learned more about nutrition, I made the switch to part stevia and part evaporated sugar cane crystals (sugar), while still using a graham cracker crust. It was a hit, and for every family or friend gathering, I was asked to bring a cheesecake. Eighteen months ago, I changed the recipe once again. Now, I use 100% Pure Stevia from Stevia Select, full fat cream cheese and sour cream, and pastured eggs. The crust is a combo of pecans, almond meal, and…yeah, real butter! The current recipe is the BEST yet!!! Many people had asked for the recipe, and only a few ever got it! I even used this Cheesecake as payment for someone to help me with my cookbook! I’m telling you, it is GOOD!!! When I was making food for the Farmer’s Market in Baton Rouge, I literally had woman “have a moment” when eating samples of my cheesecakes! Let’s just say, she was HAPPY! 😉 She could not believe that this cheesecake had no sugar, no grains, AND was low-carb! I made LOTS of friends with my cheesecake, and now I want to share it with my “Blog Family”. I was happy to finally let the cat out of the bag when I printed the recipe in my first cookbook. Once you make this cheesecake, you will know that this is the recipe for you! I have made various sizes over the years, but my favorite sizes are the mini ones (using cupcake wrappers) and the traditional 8-9 inch. 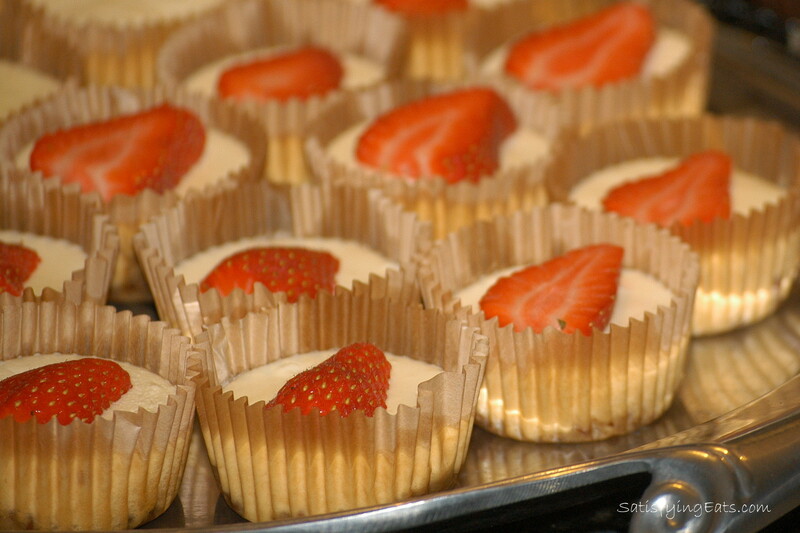 The mini cheesecakes are PERFECT for parties or baby/bridal showers. A friend requested them for both of her baby showers and they were a huge hit for mama and guests! The minis are also great for portion control. The cheesecakes can be frozen, and the texture will change just slightly, but they are still very good! So, don’t rush out to The Cheesecake Factory for a slice, make your own! See how EASY it is and how OVER-PRICED The Cheesecake Factory’s slices are! You can make an entire cheesecake for less than the price of buying two of their slices! **If you prefer Chocolate Cheesecake, check out THIS recipe on the blog or the modified version in the cookbook! Do you like pumpkin? Also check out the Mini-Pumpkin Cheesecakes in the cookbook. I typically do not use a water bath. If the large cheesecake splits, that doesn’t hurt my feelings, but if you would like to do a water bath, see HERE. Top your split cheesecake with fresh fruit, and I promise NO one will complain! Add a little almond or lemon extract for variation. This is a great recipe to use to make Homemade Vanilla Extract! I have also made a blueberry cheesecake by adding about 1 cup of fresh blueberries to the batter. If making minis, be sure to divide the crust before pouring batter. To press the crust into the cupcake liner, I use a spice bottle covered with a sandwich bag, or you could use one of THESE. If you want even smaller mini cheesecakes, use this medium scoop and it will yield about 30 mini cheesecakes. You will need about 1/2 of a batch more of crust. I used a large ice cream scoop that holds 4 tablespoons. I think my favorite kitchen tools are my scoops. I have a small, medium & large. I use them for cupcakes, cookies, cheesecakes, forming meatballs, etc. Feel free to cut this recipe in half. Use 1 whole egg and one egg yolk and half the remaining ingredients. To ensure the crust has an easy and smooth release from the pan, line the bottom with parchment (not wax) paper. Preheat oven to 300° F. In medium bowl, blend all crust ingredients. Taste for sweetness and adjust if needed. Press crust into bottom of 8-9” spring-form pan, or spoon (using tablespoon measurement) into 21 cupcake liners. Press crust down firmly. Set aside and prepare filling. In large bowl, blend cream cheese until smooth with either hand or stand mixer. Add sour cream, vanilla, and Stevia and blend. Add eggs one at a time, beating well after each addition. Do not overwork batter. Taste for sweetness and adjust if necessary. Pour into prepared spring-form pan or use large scoop and divide into cupcake liners. Bake mini cupcakes for 12-15 minutes and large cheesecake for 40-45 minutes or until the cheesecake looses its giggle (or you see a crack form). Also feel free to bake until top browns, it is a personal preference. Remove and allow to cool on wire rack. Refrigerate overnight before serving. Optional: Top with sour cream. **Serve with fresh berries, Strawberry Glaze or Blueberry Preserves. Yours is my GO-TO cookbook since I made the switch to Grain-Free. And this recipe is just one example why! This looks wonderful. Will definitely be making this. Printing the recipe now. Can’t wait to try it. Unbelievable! Can’t wait to try this! Just made the cheesecake. Looking for the recipe for the blueberry perserves. Is it in the cookbook or on the website? Gretchen, it is in the cookbook but it is a variation of the Blueberry Syrup recipe on the blog. I just don’t add water so it is much thicker and don’t need as much arrowroot powder. 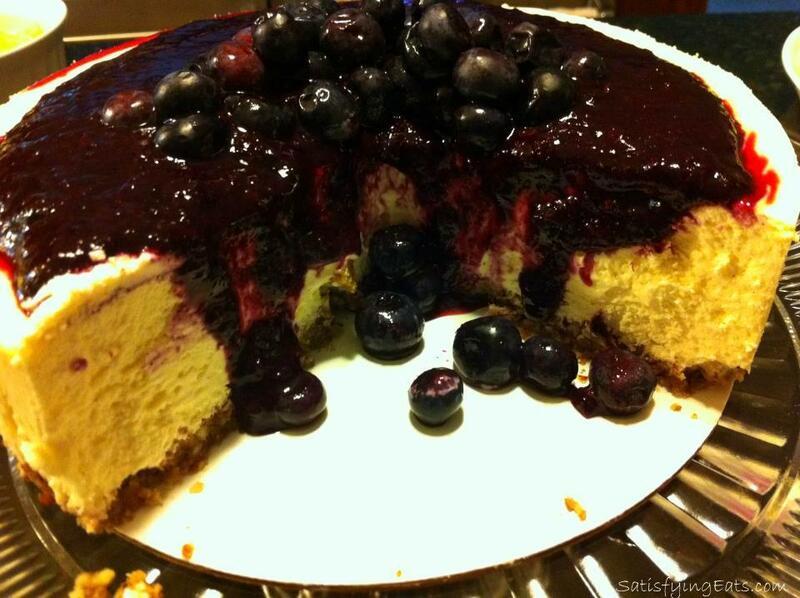 Here is link: http://satisfyingeats.wordpress.com/2013/04/26/homemade-blueberry-syrup/ Hope you enjoyed the cheesecake! Hi Melissa, I’ve discovered your blog 5 Weeks after giving birth to my second child and i’m very excited to try your recipes in my post baby weight loss adventure!! Just wondering if this recipe works with low fat cream cheese and sour cream? What’s your take on fat in your diet? Angelique, glad you found the blog! 😉 You could substitute low fat but I find that by eating the full fat versions, you get less “fillers” in the product. I personally don’t worry about fat as long as it is good fats. I know it is a hard adjustment because for so long we have been preached to that low fat and fat free are healthy. I actually look for ways to ADD fat to my diet, such as coconut oil. Hope this helps! How much is a “serving” of the stevia? Carla, I use Kal Stevia and there is an itty-bitty spoon inside that is 1 serving. You can use another from of sweetner or brand of stevia but you will have to sweeten the batter to your taste! Hope this helps! I don’t use Stevia because I get a bitter aftertaste. I use Swerve (erythritol) which measures cup for cup like sugar. What does the Stevia in your recipe equal to as far as cups of sugar? Just trying to figure out how much Swerve to use? Thanks! Diane, have you tried KAL Stevia??? I have used about 6 or 8 brands over the last 10 years and KAL is the BEST, hands down! The only way it is bitter is if you add too much. Unfortunately, I don’t have a conversion table or scale. The best way is to taste. For this cheesecake, IF swerve measures cup for cup, 1 would start with 1/2 cup. Then taste and see if you need more. People pallets are SO different when it comes to sweet that this is the safest way to determine the amount of sweetener needed. I hope this helps! Thanks so much! Yes, this is a yummy cheesecake! I made this for Christmas for our family. It was a big hit! I never leave comments, but I just had to say that I MADE this recipe and it is AMAZING! I didn’t use “Kal” Steevia, but I used organic stevia drops from our local grocery store. I couldn’t believe it was so low in carbs and sugar free. Totally delicious; I will make it again and again! I use liquid Stevita Stevia, the 96% pure, when I make this recipe. I start with the 1/4 tsp plus 1/8 tsp of the drops. After the filling is mixed, I usually end up adding a few more drops. Like Melissa has said, you really have to taste the batter and adjust it to how sweet you want it. My family has been grain and sugar free since May, so we don’t like things as sweet as other people. However, I served this cheesecake at a dinner party with military officers. Nobody could believe that it was sugar and grain free. Thank you, Melissa, for creating and sharing this FANTASTIC recipe. I usually have to find regular recipes to modify in order to stick to our Primal – no sugar, no grain, no artificial – lifestyle. I did not have to modify the ingredients in your recipe at all. The only thing I had to do, since I don’t have a spring form pan – I took an 8″ cake pan, turned it upside down and formed an aluminum foil insert to cook the cheesecake in. Once the cheesecake was completely cooled, (several hours in the fridge), I then removed it from the pan, removed the foil liner, and had a perfect cheesecake. I made this for my family on New Year’s Eve. My husband’s comment was, “This is restaurant quality!” He is absolutely right! You have outdone yourself in creating a healthy alternative to The Cheesecake Factory. I have shared your link with all I know on Facebook and Google+. 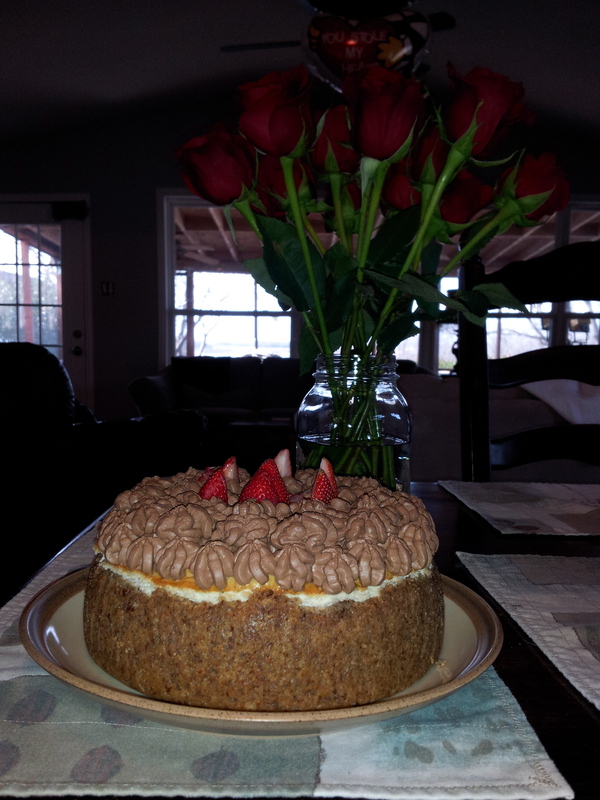 Here’s a picture of the latest cheesecake I made using Melissa’s recipe. I topped it with a frosting I made with cream cheese, sour cream, a melted 80% cocoa bar, vanilla, and stevia. Wow Sarah, it looks BEAUTIFUL!! So glad you enjoyed it! Thanks for the recipe. I’m hoping to try it out soon. I think I will probably have to at least half it. But I’m wondering what the servings are for the cake version? and is the carb count the same for the cake and a single mini cupcake one? Emer, the nutrition info is for 21 servings. So if making the large one, Divide the entire cake into 20 servings and the nutritional information will be roughly the same! Hope this helps! I made the cheesecake last night (after just finding your site when looking for pizza crust) and I am in LOVE!!!! Have you ever tried freezing the individual little cheesecakes? Thank you for sharing all your wonderful creations!!! I am about to order your cookbooks and cannot wait try it all!! 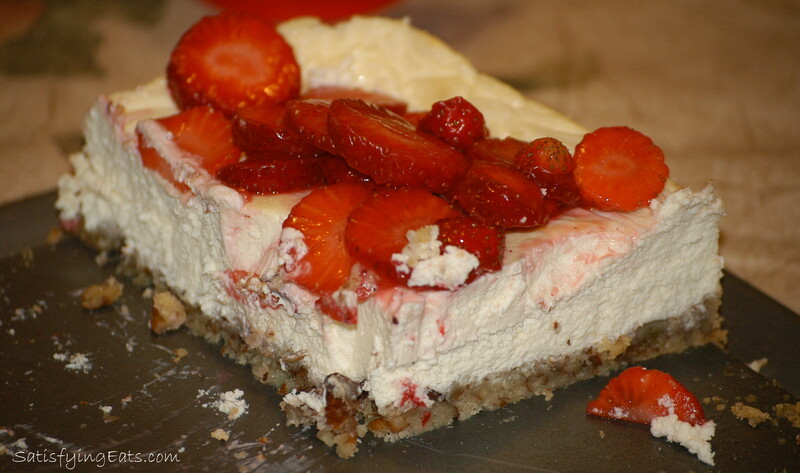 I have recently found your website and was interested in making a sugar free cheesecake. I’ve never had any luck with stevia (bitter after taste), but looked into the KAL website. Many people are saying that they’ve added MALTODEXTRIN to it and it’s from CHINA now. And that it’s not as sweet as before. Do you have any other favorite stevia brands I could try. I’ve thrown out quite a few different brands before. Lynn, yes, I am VERY disappointed in KAL’s change. I still have a bottle of the “old” stuff that I am using but I am starting to experiment with other brands. So far, I like Sweet Leaf Organic Powder. In one of my recipes that I had previously used Kal, I used twice as much as the recipe called for KAL so it seems like an easy conversion. I will have more details later… trying out more brands. I do like the Sweet Leaf: http://bit.ly/sweet-leaf-organic-stevia Hope this helps! Whatever you use, start with small amounts and taste your batter. How much coconut palm sugar would i use for this? If you use any other sweetener you will have to taste the batter and add accordingly. I know this is vague but there are so many sweeteners and everyone likes different amounts of sweetness. Hope this helps! I would start with 1/2 cup! Thanks for the tip! Does it matter if the almond flour is blanched? I use almond meal when I make the crust. I also have experimented with different nuts (walnuts and macadamia) and the crust turns out fantastic every time! Melissa has done a great job with this recipe!!! Glad you have enjoyed the recipe Sarah! Ok so we did exactly what the recipe called for and our cheesecake came out so spongy and bitter. It was not very friendly to eat. Ended up in the garbage. Did anyone else have this problem after the cooked there sponge cheesecake? Thanks and good luck to anyone else who makes this. Lindsay, I’m not sure what went wrong. This recipe has been made 100’s of times with great success and I am not sure what you mean by spongy?? Check out the comments and see what everyone else says. Jamie says: “I made this for Christmas for our family. It was a big hit! I never leave comments, but I just had to say that I MADE this recipe and it is AMAZING! I didn’t use “Kal” Steevia, but I used organic stevia drops from our local grocery store. I couldn’t believe it was so low in carbs and sugar free. Totally delicious; I will make it again and again!” About the bitterness, what sweetener did you use. ALWAYS taste your batter before you bake and adjust the sweetener to suite YOUR taste. That’s a given rule. Hope this helps! Looking forward to trying this recipe this weekend. Can you tell me about pasturized eggs? How are they different than regular eggs and where do I get them? Alicia, pastured and pasteurized eggs are very different. Pastured eggs are eggs from chickens that are free to roam and eat bugs and worms, you know, chicken food. Pasteurized eggs are those that have been heated to kill any potential bacteria but it makes the eggs less nutritious. For PASTURED eggs, check out your local farmer’s market or even Craig’s List for a local chicken farmer. You want eggs straight from the chicken! I hope this helps and I hope you enjoy the cheesecake! We are dieting at my house! My question here is: Can this cheesecake be made in a crustless form? Do you know what changes, if any, need to be made, as in maybe more cream cheese? I found crustless recipes using low-fat cream cheese, but I am NOT a fan of anything low-fat (due to the fillers). Any suggestions on this question are greatly appreciated. Thanks. Pat, no changes, maybe just oil the pan (or use cupcake liners if doing minis). Good luck! This recipe is BEYOND good. I made the full recipe and I’m pretty sure I’m going to eat it in 8 slices, even though it’s designed to serve 20+… ha! I have looked at this recipe and it looks delicious. I cannot wait to try this recipe! 🙂 I saw the comments about the Kal Stevia. I did a little search of my own and I came across, what I THINK, is the old stevia on vitacost.com. They have several different types of the powder and liquid drops and from what I read in the product details, it is pure stevia extract with no bad aftertaste and no calories. I hope this is what you are looking for. Try it out! 🙂 Hope this helps!!! I am looking through different stevia powders and liquid drops. Would you recommend liquid drops?? If so, ho much should I use? Angela, I have only tried drops once and to be honest, I wasn’t impressed but you can use what you like. I know others that like the drops and have used them with great success. It’s hard to give an amount because all brands are different and everyone’s sweet tooth is a bit different. Add a little and taste and adjust if needed. I know this sounds un-scientific but it works! Good luck and I hope this helps! I just made these for Easter dessert and they are delicious! The crust especially is satisfying. Thanks for the recipe. I am new to the low-carb thing, but have not crossed over into the dessert realm yet (I’m afraid once I do, it will kick me off the bandwagon!) I’ve been absolutely dying for sweets though, cheesecake especially, so I’ve beey eyeing this recipe for a couple of weeks. I am confused though with all the sweeteners out there, and how to use them in baking, and which ones will taste the best. Since the Kal you mentioned is no longer a tasty candidate, I see you mentioned Sweetleaf powder. After experimenting, is this still what you would recommend, and if so, how much of that would you use in the recipe, in place of the sweetener you used originally? Can that particular powder be used as a substitute in most recipes, and does it change the consistency of the product? (My next dessert of choice would be some sort of cupcake – I’m not a natural in the kitchen, so even making “normal” desserts is hard enough for me, nevermind having to figure conversation and how they impact textures, etc.) Thank you in advance – can’t wait to finally try this! i am trying out your cheesecake recipe, will take your advice on cutting the ingredients in half. was wondering if u can give me your opinion on not adding any sugar or sugar substitutes. i find the stevia to have a very bitter after taste. i looked into trying out the Stevie u recommended in your recipe , i was disappointed with the change of ingredients, would i be able to add coconut cream instead ? Hanna, use whatever sweetener you like and feel comfortable with. I have just switches to using Trader Joe’s Organic and I really like it. I would not use coconut cream in this recipe, that would be a completely different recipe and method. You will definitely need some sort of sweetness to this recipe, the amount and kind is up to you. thank you very much > have u ever used green powdered stevia in your recipes ? I haven’t and from everything I have read, it doesn’t taste good. O! Mine wasn’t sweet enough! I used 3 packets of Skinny Girl organic stevia in the filling. It tasted fine when I was making it. I was afraid of adding too much and ruining it. I guess I added too little and ruined it. I’m left with a salty, sour cheesecake:( I did get 24 regular cupcake size cheesecakes, filled to the brim, with this recipe. O well! Kris, some stevia brands cook out more than others. One way to determine the final sweetness of a recipe is to microwave a small amount for 20 seconds. I use this method for cakes, muffins, etc. 3 packets of stevia doesn’t sound like a lot to me, I would start with 1/2 cup sugar equivalent and go from there. I have been using Trim Healthy Mama pure Stevia and their Sweet Blend. It does not have an after taste and is the best that I have found. They have a conversion chart on their website. Their sweeteners are on sale right now. 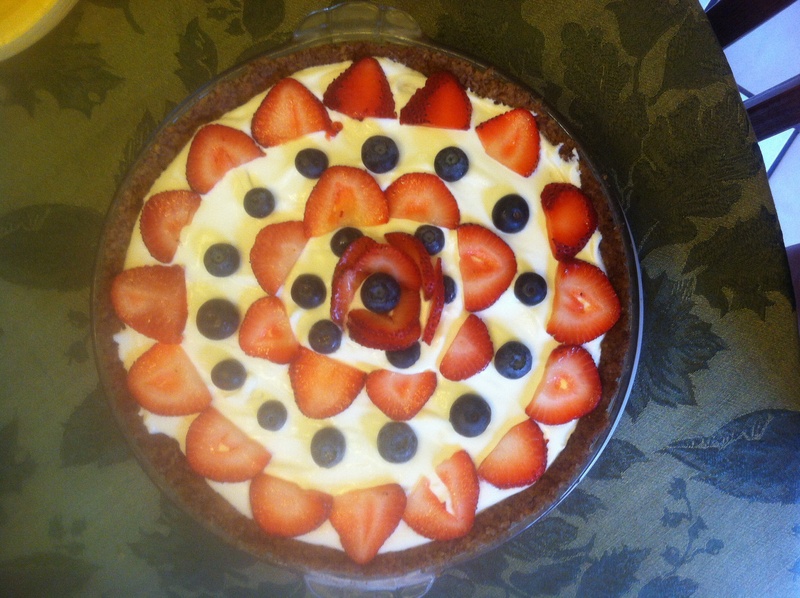 I made it into a festive pie for the Fourth of July! Does this recipe actually call for FOUR blocks of cream cheese or am I misunderstanding?? Bridget, yes. 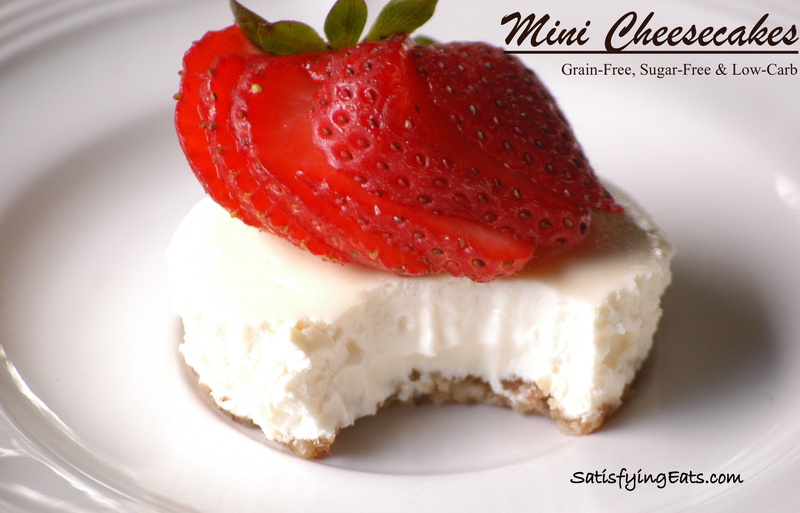 The full recipe make a large cheesecake but feel free to half the recipe for a smaller cheesecake or for minis! I made these and they came out to 30 filled to the brim cupcakes…then 6 of them sank, the one’s with no crust because I hadn’t planned on that many. They never did stop jiggling, and I pulled them out after 45 minutes, they were still pale on top. I hope thats right. Two of these have sunk. I will just let them cool and refrigerate overnight and see what happens. I’m thinking I must have done something wrong. Hmmm Nancy…. I have never had any sink and after 45 minutes for the minis they should have been burnt. Are you sure your oven temperature is correct?? It’s possibly they will magically set up overnight but I have never had this happen (or heard anyone else have this complaint). The mini’s cook really fast. If you are in question about how accurate your oven temperature is, you can get an oven thermometer. I actually did this because my oven was not getting up to temperature. Them being pale is not a problem but I am not sure why yours isn’t setting up. Let me know how they turn out. Well they all ended up sinking! I ate them anyway over several days, LOL. I have never made cheesecake before, this was my first attempt. They tasted ok, though my kids said they could taste the stevia, we don’t have kal stevia ( I think you’re using something different now? We have Swerve and truvia, maybe we can try those next time.) My oven is about a year old, and seems to work right with most other recipes, but I will look for an oven thermometer to make sure. The only other thing I can think that could possibly affect baking things is that our town is barely above sea level (about 250 feet), and maybe your altitude is much higher and that could make a difference. I don’t know how to adjust for that though. Anyway, I’ll try again! Thank you for your help! I made your cheesecake yesterday. Could hardly wait to see if it set up over night. Not that I doubted your instructions, it was just hard to go to bed with out a slice. It turned out perfect. Thank you, thank you, thank you! I used a 9″ springform pan and froze half of it. The other half is being slowly devoured. I didn’t even bother to make a fruit topping. I know I would like that but I love plain cheesecake so this time it will just stand on its own. The only thing I did different was to use the equiv. of 3/4 c. sugar in the form of combining Swerve granular, erythritol granular and Kal Stevia … I still have a bit left of the old formula. Sweetness was good, not too much. Took me nearly a year to get around to this recipe. I’m very happy I have. Now it will be a regular. We absolutely LOVE this cheesecake recipe. I use 1/8 tsp. Sweet Leaf Stevia for both the crust and filling. Thanks you! Hi Melissa…thanks so much for the recipe. Now, if I were to use the crust for a no-bake cheesecake, would I bake the crust or just put it in the refrigerator to firm up? Julia, I would bake the crust and let it cool before filling! Patrick, did you taste the cheesecake before you baked it? If you’re new to using Stevia, some people prefer using part Stevia and another sweetener. If you use too much stevia, it will be bitter but the amount will vary from palate to palate. I am allergic to all nuts – What flour could I use instead? Sunflower seeds and sunflower seed flour would make a good swap. I would probably use gelatin but I have never tried it in this recipe. I do have a no bake blueberry cheesecake that uses gelatin though. As a follow-up, to my question yesterday about the time & temperature, I just wanted to let you know how absolutely amazing this cheesecake turned out. OMG, it’s as good as any cheesecake I’ve ever purchased. It is so creamy and works perfectly with the crust. The only thing I substituted was Xylitol for the stevia. I ground the xylitol so the grains weren’t so big (I made it a little powdery) and used 3/4 cup. I cannot wait to hear what my husband thinks of it (I gave him a piece for work today and we weren’t able to taste it last night except for my little test. Thank you so much. I really needed this recipe. It’s really hard giving up bread. Has anyone tried this recipe with equal or Splenda ? If so, how much did you use, and how did it taste? Robin, I do not have an amount if using the sweeteners but it will definitely work. Maybe add 1/2 to 3/4 a cup of Splenda and then taste. Add more until your desired sweetness is achieved. I made this for my family & the only thing I substituted was liquid sucralose (just a few drops) in place of the Stevia, only as a taste preference from desserts I’ve made in the past. The only thing I had problems with was the timing. The taste was fantastic but at the 50 minute mark, it was still too runny to take out. At 55 minutes, I was so nervous it would overcook that I took it out. I put it in the refrigerator over night but the texture was still very gooey, almost runny when I cut it. The taste was so good though that nobody cared! Everyone kept saying it tasted just like real cheesecake but I’m still trying to figure out the timing. I’m wondering if possibly the switch to liquid sucralose could be issue? Leslie, yes, adding more liquid to the cheesecake will make it harder to set. Glad everyone still enjoyed it! How much stevia select would you use in this recipe for sweetener? I have already ordered that on amazon since you use it in so many of your recipes. Thanks! The recipe states 1/2 tsp for the filling but if you are new to Stevia, add a little less and taste and adjust if needed.